2014 Volvo XC60 Pros and Cons: Why (Not) This Car? People used to buy Volvos because the company had developed a reputation for safety. In recent years this hasn't been enough, as other companies, and especially other luxury brands, have similarly made safety a top priority. While Volvo still offers some new safety features ahead of everyone else, their lead is never long. So they have had to develop other reasons for people to buy its cars. For 2014, the Volvo XC60 crossover has been updated. Why buy this Chinese-owned Swede? Scandinavian design is most evident in the floating, gently curved, matte wood-trimmed center stack. Why the 2014 Volvo XC60? While the XC60's very Scandinavian interior eschews eye-grabbing elements, it avoids the cold severity of the Germans. The cabin of the Mercedes-Benz GLK (reviewed here), though it contains more square inches of wood and blingier chrome, isn't nearly as warm and inviting. The differences are often subtle, but they add up to my wife Gayla's impression that "someone really worked out the details." Upgrades for 2014 include a new shifter to replace the chintzy, clunky old one and the premium compact crossover segment's only full LCD reconfigurable instrumentation. Elegance, ECO, and Performance themes (the last of which centrally locates the tach) can be further varied between solid and gradated color schemes (white, green(ish), and red, respectively). The Cadillac SRX similarly stages a light show, but the Volvo's is more tasteful. To the organically flowing surfaces and floating center stack of all XC60s and the matte-finished "linear" wood trim that's a no-cost option on the T6 (but not offered on other XC60s), a $2,300 Inscription Package adds stitched dark gray leather on the instrument panel and soft white leather on the seats. (The seats can also be dark gray.) German manufacturers and Cadillac offer similar high-end trim packages on their larger, much more expensive models, but not on their compact crossovers. So if you want top-notch materials in a vehicle with the XC60's size and price, the Volvo is your only option. Volvos have long been renowned for seat comfort, and the XC60 continues this tradition with seats that are thoroughly supportive without being as firm as those in the Cadillac and in the German crossovers. This said, some people might find the headrests overly intrusive. The Inscription Package adds power lumbar adjusters to both seats. Otherwise these adjusters are manual. Notable in its absence: front seat ventilation, offered in the Audi and Cadillac, isn't an option in the XC60. Also, no massage. Volvo's signature tail lamps flow over strong shoulders. Four knobs a good idea, but overall the controls could be easier to use. Volvo might no longer have the safety lead it once did, but the XC60 is one of three midsize luxury SUVs with a top safety rating from the IIHS. One of the others is the aging Volvo XC90, while the third is the latest Mercedes-Benz M-Class. Virtually all other competitors receive the next-highest rating, in some cases because they haven't been subjected to the full battery of crash tests. The XC60 received a "good" (the highest rating) in every current test. Beyond the crash test scores, the XC60 comes standard with low-speed automatic braking, "City Safety" in Volvo speak. An optional Technology Package includes all-speed adaptive cruise control, forward collision alert with detection for both cyclists and pedestrians, automatic high-speed braking (if you ignore the preceding), a lane departure warning system, a drowsiness monitor, road sign information, and auto-dimming headlights. Competitors also offer most of the contents of this package. But the Volvo's lane departure warning system is much less annoying than most, with a soft d-d-d-d-d rather than the typical warning chime. To borrow Gayla's words again, "It doesn't act as if you've just committed a crime." The road sign information system actually reads traffic signs. If you have a tendency to forget what you just read, you'll appreciate its assistance. But, unlike nav-based speed limit info systems, this one can't report the speed limit until it sees a sign. Volvo doesn't yet offer blind spot intervention and lane departure prevention (some competitors, including the GLK, do). So the XC60 will only warn you if you're in danger of hitting a car in the next lane, it won't stop you from doing so. Pay attention to the warnings (or simply the large mirrors), and prevention won't be needed anyway. Even when fitted with 20-inch wheels (18s are standard), the XC60 has the most luxurious ride in the segment. Not only does the suspension absorb bumps very well, but together with excellent sound deadening it delivers the cushy, insulated feel that separates premium from mainstream vehicles. When the XC60 was first introduced, I found its combination of a long nose with a pinched midsection unsightly. But get rid of the 2010 base model's gray lower body cladding and upsize the wheels from 18s to 20s (standard on the R-Design and optional on the T6 with the Inscription Package), and the XC60 looks much better. I still wouldn't call the exterior beautiful, but it is more interesting than the Audi's smooth, formless egg, more artful than the Mercedes-Benz's upright cube, and less jarring than the Cadillac's sharp edges. The 2014's new face is even more car-like than last year's. Those seeking a pretty crossover rather than a rugged-looking one could find the Volvo's exterior the most appealing. Why Not the 2014 Volvo XC60? The XC60 T6's comfy ride has a price: it doesn't handle with the control or precision of a BMW X3, Audi Q5, or even a Cadillac SRX. Owing to numb steering, it's hard to get a feel for the XC60 in hard turns. What you can feel is more understeer than elsewhere despite the inclusion of brake-based torque vectoring. In bumpy turns the rear end can feel a touch unsettled. Left to itself, the stability control cuts in too early and too strongly, forcing the XC60 into a plow mid-turn. But toggle through the menus to select its sport mode (every time you start the car), and the system behaves appropriately. The XC60 R-Design includes firmer steering and suspension tuning, and handles better as a result, but still doesn't lead the field in athleticism. And you can't get the Inscription Package or the matte wood trim with it. Care much more about ride quality than athletic handling anyway? Then you likely won't mind this shortcoming. Volvo has a new, highly fuel efficient four-cylinder engine on the way. 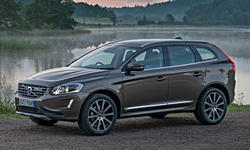 For 2014, though, the XC60 continues to be powered by a trio of 3.0-liter sixes that lag most competitors in fuel economy. The T6 scored 17 mpg in the EPA's city cycle, and 24 mpg on the highway. The Cadillac SRX does even worse (16/23), but the Acura RDX (19/27), Audi Q5 3.0T (18/26), BMW X3 35xDrive (19/26), and Mercedes-Benz GLK350 (19/24) all do better. These disappointing test scores were validated during my week with the car. In suburban driving the trip computer average usually ranged between 18 and 20. Even with a light foot 22 wasn't easy to achieve. More car-like face for 2014. Merely sufficient room, but comfortable height. The XC60's new LCD instrumentation is excellent. My issue is with some of the controls. Many functions require a tedious amount of clicking and knob-twirling. With those that involved three controls on the left stalk, the logic isn't always consistent and could be more intuitive. Most functions involve the top right knob on the center stack. A console-mounted knob, as in the German crossovers, would be easier and less distracting to operate. It also doesn't help that the infotainment display is smaller than most. Nothing outright maddening here, but there's definitely room for improvement. The XC60's 240-horsepower base engine is a rarity among 2014 models. A naturally-aspirated inline six of middling size (3.2 liters), it can't match the midrange power or fuel economy of competitors with turbocharged fours. The T6's turbocharged 3.0-liter engine accelerates the XC60 much more effortlessly, and about as quickly as other compact crossovers with boosted sixes. Not only does power get a bump from 240 to 300 horsepower, but peak torque (indicative of midrange power) jumps from 236 lb-ft at 3,200 rpm to 325 lb-ft at 2,100 rpm. There XC60's rear seat doesn't include much knee room, but it is mounted at a comfortable height. Most competitors are about equally roomy in back, though the GLK is a little tighter and the RDX a little roomier. Specs for the XC60's cargo volume--30.8 cubic feet with the seat up and 67.4 cubic feet with it folded--place the Volvo at the head of the class. The Acura and Cadillac hold 90 percent as much, the Audi and Mercedes even less. Bonus points would be due the Volvo for a folding front passenger seat--something the others don't even pretend to offer--except that the seat's bolsters prevent it from folding flat and its back isn't a suitable load surface. My initial impression of the tested Volvo's $53,215 price was that it was too high. Oddly, the vehicle didn't include xenon headlamps. Add another $800 for those. Then I checked the prices of competing vehicles. The Volvo included over $10,000 in options (the 3.2 starts at $35,765, the T6, with all-wheel-drive standard, at $42,465). Comparably equipping the others similarly inflates their prices, even though they don't offer a similarly lavish interior trim package. An Audi Q5 3.0T checks in about $5,500 higher. A Mercedes-Benz GLK lists for about $3,300 more before adjusting for feature differences, and about $4,200 more afterwards. So why isn't the Volvo's price among the reasons to buy one? Well, a comparably equipped Cadillac SRX undercuts the XC60 by about $2,000. And the Acura RDX costs much less than the others. Granted, it's not quite the same sort of car. Equip the Volvo to the same level as a loaded Acura, and it lists for $48,315, $5,700 less than the tested vehicle. Even so, the RDX comes in $7,800 lower still before adjusting for remaining feature differences, and about $6,300 lower afterwards. It turns out there are plenty of reasons to buy the Volvo XC60 besides safety. Its quick, rides well, and can carry plenty of your stuff. Its price comes in below the Germans, if above American and Japanese competitors. But, more than any of this, the XC60 scores subjectively, with artful styling, luxurious interior materials, and comfortable seats. Gayla rarely cares for the cars I test, but she badly wanted to keep this one. Tranverse-mounted inline six unique among current cars. Best in class cargo volume with seat folded. Volvo and Mercedes each provided an insured car for a week. 2014 Volvo XC60 pros and cons, according to Michael Karesh: the best reasons for buying (or not buying) the 2014 Volvo XC60. Join TrueDelta to post your own impressions.